With 'chilli on the brain' thanks to our HELLO HOT STUFF competition currently on the go in celebration of the launch of our new chilli tin range - we couldnt resist raising the temperature a few more notches with this feisty and en-trend recipe featuring our GHOST CHILLI SEASONING! Drizzle the steak generously with olive oil. Add the garlic and rosemary and dust with the Cape Herb & Spice Ghost Chilli. How much you use depends on how hot you like it. Toss through to ensure the steaks are evenly coated. Allow the steaks to marinate for at least an hour. Heat a large, heavy-bottomed pan and add three tablespoons of olive oil. Once it’s seriously hot, add the steaks. Don’t let the delicious garlic and rosemary you marinated the steaks in go to waste, add them to the pan as well along with the butter halfway through the frying time. When the steaks are done to your liking, squeeze over the juice of half a lemon. Place steaks on a plate, pour over all the pan juices and cover with tinfoil to keep warm. Wipe the pan clean with kitchen towel and add three tablespoons olive oil. Add the onions and fry until they are nicely caramelized. It takes about 10 minutes. Add the whole tomatoes to the same pan for a few minutes towards the end and cook until they are blistered. Slice the buns in half and toast them in a dry frying pan or on a hot griddle. 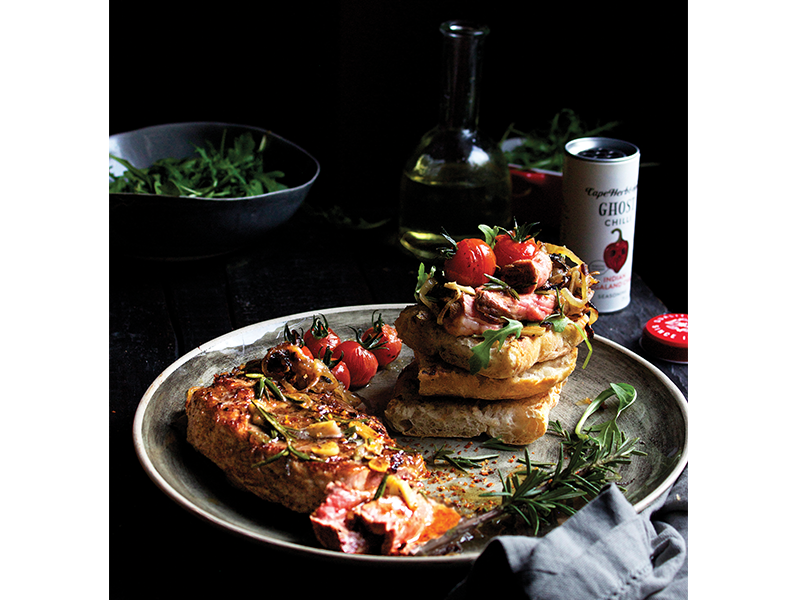 Top the rolls with rocket, steak, the onions and roasted tomatoes. Drizzle over the garlicky, lemony resting juices from the steak and tuck in.